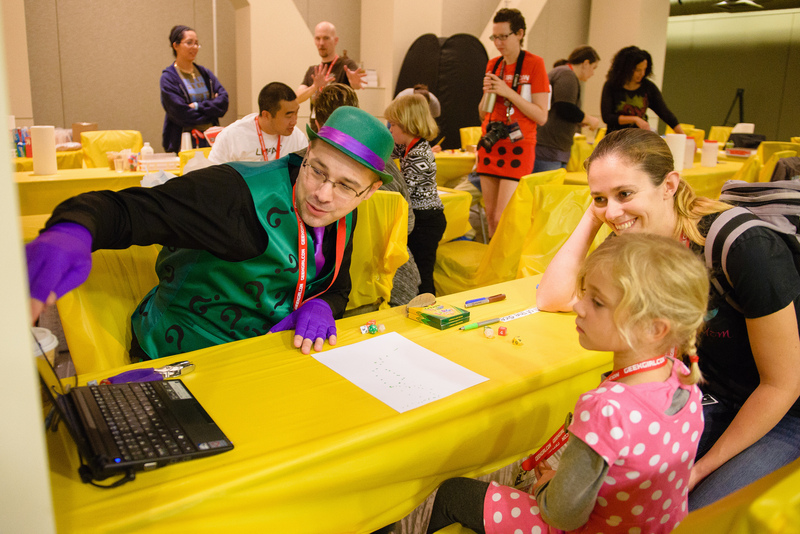 Last year at GeekGirlCon, I had the privilege of participating in the Do-It-Yourself Science Zone teaching kids about probability and randomness. However, being The Riddler, I had a secret agenda in mind while doing my demonstrations–I have a trio of ten-sided dice that I use to gamble with my fellow super-villains, and I wanted to figure out which of them, if any, had a bias for or against any particular number. What better way to find out than to offload the boring task of rolling those dice over and over again onto unsuspecting passers-by? This post originally appeared on the Double X Science blog. On Saturday, October 11, I presented the Double X Science Notable Women in Science series at GeekGirlCon ‘14. 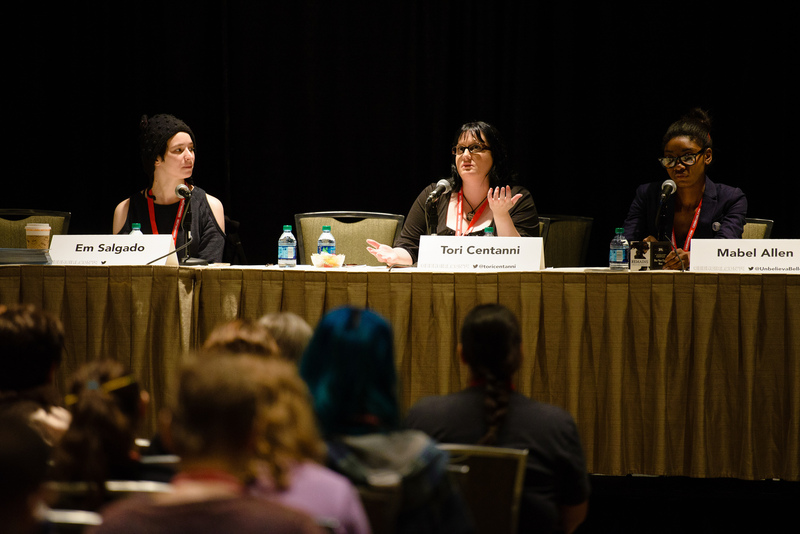 Thanks to everyone who were able to attend GeekGirlCon and attended the panel! There were around 50 people attending, despite stiff competition. A packed panel room greeted panelists for the Cosplaying While Fat. As soon as I learned there’d be a panel on 3D printing at GeekGirlCon ‘14, I knew I had to attend it. This is the future! I’ve thought every time the machines come up in conversation. They’re an endless source of fascination for me, yet I’d never seen one in person before. Many attendees must’ve felt the same way, because the room was absolutely packed for the panel. Presenter Breanna Anderson kicked off the discussion with an impassioned demonstration of 3D computer software. A software innovator and platform builder for over three decades, she used a wireless stylus to quickly design a chair that looked perfect for a dollhouse. Her hand was so adept at “drawing” the object—adjusting angles here, lengthening its legs there—“oohs” and “ahs” were uttered throughout the crowd several times. So cool to see someone perform their life’s work live. Even though the program was obviously extremely advanced, it made me want to jump right in and try it. Not only did I have no idea there are so many online services for creating awesome 3D projects—I would’ve never guessed how many of them are free to use. Audience members were given a handout listing seven different modeling software sites (provided at the end of this article). The fact that these high-quality programs are available at no cost is honestly beautiful to me (similar to how Wikipedia’s values can make me weepy). Printing the products is another story, of course, as the materials and machinery require money, but it’s great that people can familiarize themselves with the software for free. Once an object has been crafted virtually, Anderson shared, there are three options for having it printed. People can visit and utilize local printers, send it to an online company for printing, or purchase their own 3D printers. I was thrilled to learn about several Seattle-based printing options, including FATHOM Studio, located in the Fremont/Wallingford area, and Mirrim 3D Portraits, of which Anderson is the president. FATHOM sells printers and offers high-end printing services, while Mirrim offers creative items like personalized wedding cake toppers and cosplay accoutrements. Next, presenter Ericka M. Johnson shared her expansive insight. As a designer of printed equipment for her genetics lab, she also unleashed a flurry of 3D printer facts. She taught that the three most common materials for the machines are polyamide, ABS plastic, and ceramics, and dove into their pros and cons. Polyamide, for example, is strong, slightly flexible, and inexpensive, but when used for large flat panels, it has a tendency to warp. ABS, on the other hand, is durable, recyclable, and UV-resistant, but slightly more expensive. Finally, ceramics involve the binding of different layers of powdered clay, resulting in potentially “amazing glazes”. However, because of the nature of clay, it has to be at least three centimeters thick, and the bigger the piece, the thicker the walls need to be. Also, before the piece has cooled, if gravity is acting on areas of it that are not properly supported, it will have a more difficult time standing up, increasing the risk of damaging the entire final product. For those interested in owning personal 3D printers, Johnson outlined three go-to options. First, Printrbot’s Simple Maker’s Kit is a steal at just $300. The easiest one to use, though, is the UP Plus 2, which acts like a “plug ‘n play” system, ready to go almost instantly. For those looking to invest a bit more, the coolest choices in Johnson’s opinion are the Ultimaker 2 (~$2,565) and the Makerbot Replicator 2 (~$2,199). The speedy delivery of all this info (just fifty minutes to share it all!) by Anderson and Johnson indicated just how much more there is to learn. Whether you’re brand new to it or consider yourself an expert in the field, you’re welcome to check out the Seattle 3D Printing MeetUp group, as well as the other resources listed below. I’m excited to see what else these seemingly-magical machines will make possible for humankind. In-depth articles already suggest that, thanks to them, the creation of prosthetics and even internal body parts will be easier and more affordable down the road. Designing and printing a 3D object is now on my short-term bucket list (because yes, I am a geek with both long-term and near-future lists); I just have to decide what I want to make first! 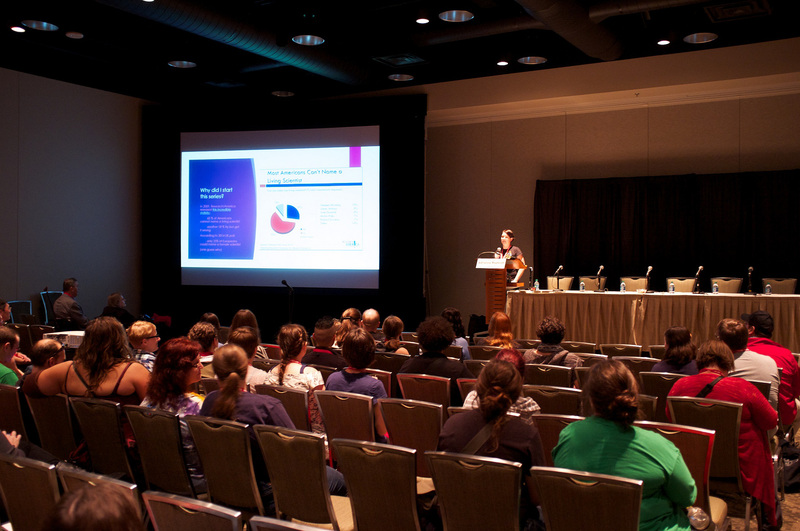 Want to learn more about the panels at GeekGirlCon ’14, or contribute your own great ideas to GeekGirlCon ’15? Follow us on Twitter to find out when programming calls open, and pick up your passes for next year’s Con today! Breanna Anderson is a software innovator creating solutions and building platforms that help others solve problems and she’s been doing it for over 30 years. She helped launch the era of commercial Internet publishing as a technical founder of MSNBC Interactive. 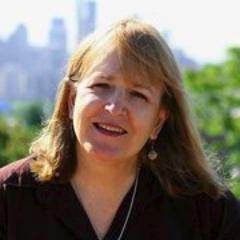 While at Microsoft in 1995, she created one of the first enterprise-scale, general purpose Web CMS systems, InterPress, with the vision of democratizing publishing through the web. She founded venture-backed SchemaLogic Inc., in 2001 to create a “techno-social collaboration platform” to facilitate better information sharing through consensus-based information standardization. She is now bootstrapping a new venture: Mirrim 3D. It merges her diverse interests to combine computer vision and modeling with 3D printing to offer a new dimension in personal portraits: super-realistic, full color 3-dimensional mini-portraits. Ericka M. Johnson is addicted to projects. 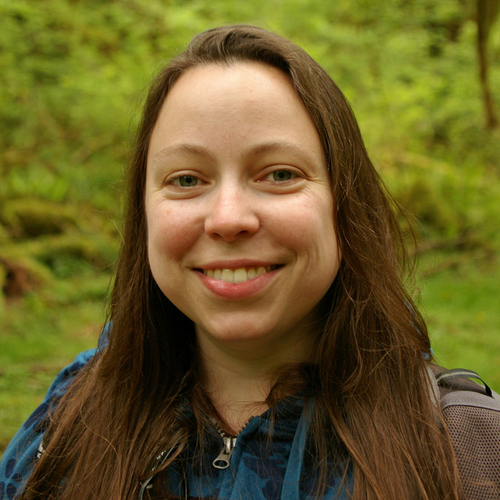 From creating the Steampunk Exhibition Ball, to designing and 3D printing new equipment for her genetics lab, to leading the board of Seattle Atheists, she just can’t stay idle. 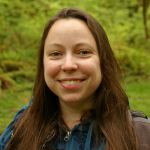 And now that 3D printing technology has advanced so far and become more affordable to tinkerers, she’s itching to share what she’s learned on this new maker frontier. I wanted to go to this panel because Jamala Henderson was the moderator, and I love her voice and her presence. She and I met for the first time at the premiere of Captain America: The Winter Soldier this year, and now I’m part of a group of Marvel enthusiasts that shares awesome upcoming Marvel things with each other. I also wanted to go to this panel because I am a little bit of a history geek. Not about every aspect of history, but the history of fandom is definitely something that sparked an interest. 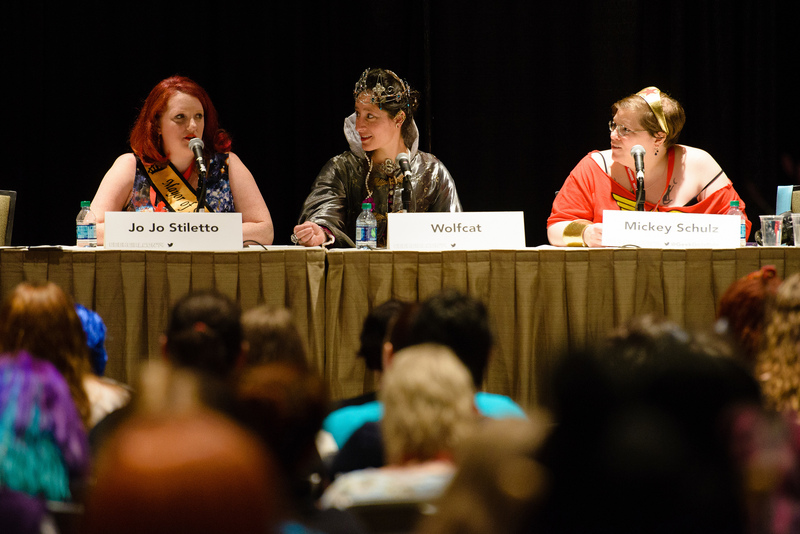 I know MY history with fandom, and I love hearing other people’s histories as well–and this panel was the ultimate history of women in fandom. The speakers in the panel were four women with various connections to the beginnings of fandom: Linda Deneroff, Susan Matthews, Maggie Nowakowska, and Tish Wells. Each of these women was involved in the beginnings of media and print fandom in the 60s and 70s, primarily around Star Trek and Star Wars. They each spoke about the first books they read that got them into science fiction–everything from Freddie and the Space Ship to Isaac Asimov’s I, Robot to the novels of Edgar Rice Burroughs. Jamala asked the panelists what they loved about those early science fiction books they read. Susan said, “It was a new world where anything could happen, but there wasn’t any magic!” Linda was struck by the commonalities between what she was learning to read and the advent of the United States space program. Maggie read all the kids’ science fiction books available in her local library, and then moved onto the adult books (which is just what I did!). Tish spoke briefly about an author named Hugh Walters and how she read every book he wrote. The conversation moved from books to fandom, and how the women got started in media fandom, specifically. All four of them had the same response: Star Trek. They saw the show, then worked on Star Trek fanzines, attended Star Trek conventions, joined Star Trek discussion groups, and cosplayed the characters they liked, whether they were men or women. There wasn’t anything special about a woman dressed as Han Solo or Luke Skywalker; they wore what they wanted to wear. Having fandom in their lives inspired all four of the panelists in different ways. Susan began writing her own fiction in about 1978, but often kept it to herself. She published her first novel in 1997. Linda was inspired to take up photography, as well as publishing and traveling. Maggie started helping to publish fanzines–most of which were written, typed, mimeographed, and compiled (all by hand) to be sent around the country. Tish said fandom became part of her life as a journalist as she wrote her first published piece on a WorldCon; that piece got her a job, which sent her to Los Angeles for a Star Wars costume exhibit, at which she met and interviewed George Lucas! 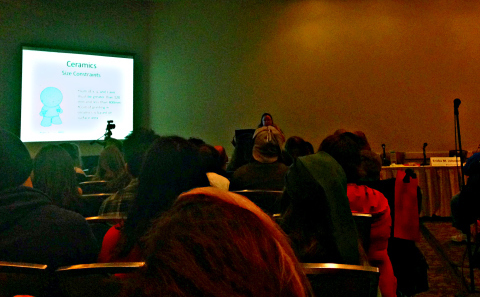 All of them said they “found their ‘selves’” in fandom; there was a huge community linked to fandoms and conventions. They encouraged each other to do what they loved, it was powerful enough to keep them doing it. They told stories of women whose husbands wouldn’t allow them to attend science fiction conventions because their husbands “needed them home to cook their meals”. One woman apparently put together fanzines in her car, because her husband wouldn’t allow them in the house. There was even a woman they knew who was institutionalized! Her husband thought that the things she was doing and wanted to do around fandom were literally insane. This sounds like something out of the nineteenth century, or maybe even the early twentieth century; but these happened in the 1970s and 1980s, here in the United States. Each of these four women have learned very powerful things in their lives through fandom. Whatever it is, you can do it. I left this “Geek Elders Speak” panel with tears in my eyes, a lump in my throat, and the determination to learn more about the history of women in fandom. 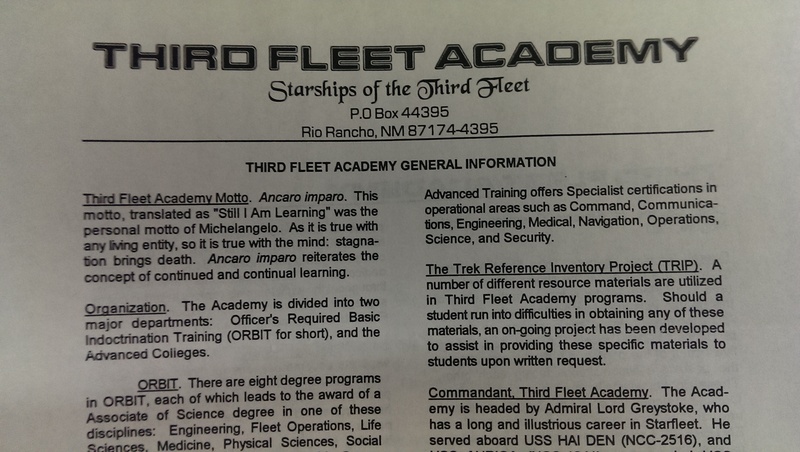 I know my history, and I knew about some of the early fanzines; I was even part of a correspondence fiction club called The Third Fleet out of California where we made our own characters, took Starfleet ranks, and were placed on “ships” (groups of other writers) to write stories with our characters and fellow “shipmates”. But nothing I did when I got into fandom prepared me to hear Maggie, Susan, Linda, and Tish speak about their experiences. I’m proud to be part of their ranks, years later, and thinking of ways to do some of the kinds of things they did: building and fostering community, mentoring each other (both in life and fandom), and making sure that what they did–how they built and fostered the communities we have today–continues to grow. 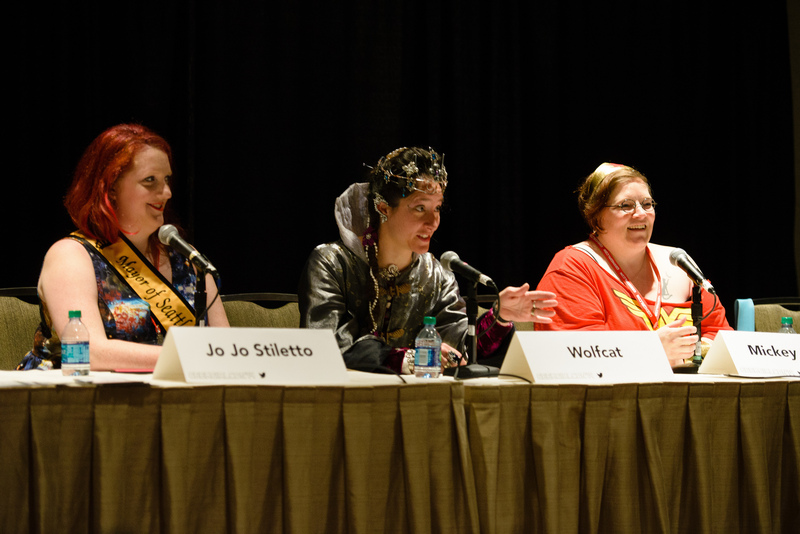 If you were at the “Geek Elders Speak” panel at GeekGirlCon ‘14, what impressed you the most about the panelists? How did YOU come to fandom? And if there was one thing you could do to help others in our community and build their fandom experiences, what would that be? 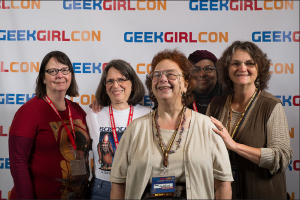 And guess what: you can already get your tickets for GeekGirlCon ‘15! We’ve sold out entirely two years in a row, and next year is our fifth anniversary. Don’t miss it! Below is a bibliography of some of the books and publications mentioned and discussed by the panelists; Maggie Nowakowska forwarded it to GeekGirlCon so we could share it with anyone who wants the information, and to learn more about early media fandom. Space Cat, Ruthven Todd (orig. 1952) For the young girls in your life. This was the very first book I took out of the library when I was in 1st grade. Star Trek Lives!, Jacqueline Lichtenberg (1975) A classic, written by a media fan, that allowed many women to discover Star Trek fandom. If you’ve ever wondered how Trek fandom came to be an grew so powerful, this is a good book to read. Textual Poachers: Television Fans & Participatory Culture, Henry Jenkins (1992) An excellent resource for tracking the early media fanzine phenomena, including the early copyright conflicts; mentions some fan writers by name. Enterprising Women: Television Fandom and the Creation of Popular Myth, Camille Bacon-Smith (1992) A frank discussion of how fandom developed socially in the 1980s. The author participated in fandom herself and describes the ways a fandom supported and challenged women in the 1980s. IMO, Bacon-Smith nails the problems that often arise between those who made up the “first fandom” of a favorite series and the “second fandom,” made up of those who join later, bringing different, often conflicting interpretations to the mix. Science Fiction Audiences: Watching Doctor Who and Star Trek, John Tulliock and Henry Jenkins (1995) Follow up the Textual Poachers, with a tighter focus on Whovians and Trekkers. Boldly Writing: A Trekker Fan and Zine History, 1967-1987. 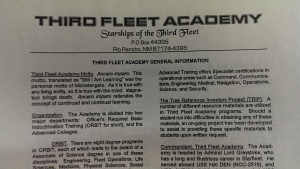 Joan Marie Verba (1996) A year-by-year review of Star Trek fandom by someone who was there. If you want to travel the years of fandom vicariously, this is the book for you. All the people who paved the way for media fandom, all the social and fanzine developments, are here. Fan Phenomena series: Star Trek, Star Wars, Buffy the Vampire Slayer, Batman, Twin Peaks, Doctor Who, Supernatural, Sherlock Holmes, Jane Austin, The Hunger Games, Various editors (2013) England brings us a series of books about many of the world-wide media fandoms that have developed over the years. How Star Wars Conquered the Universe, Chris Taylor (2014) An excellent history about how Star Wars, and Star Wars fandom took media fandom mainstream and made Star Wars the phenomenon that it is. Deeply researched, this book will take you into the heart of the Star Wars experience. 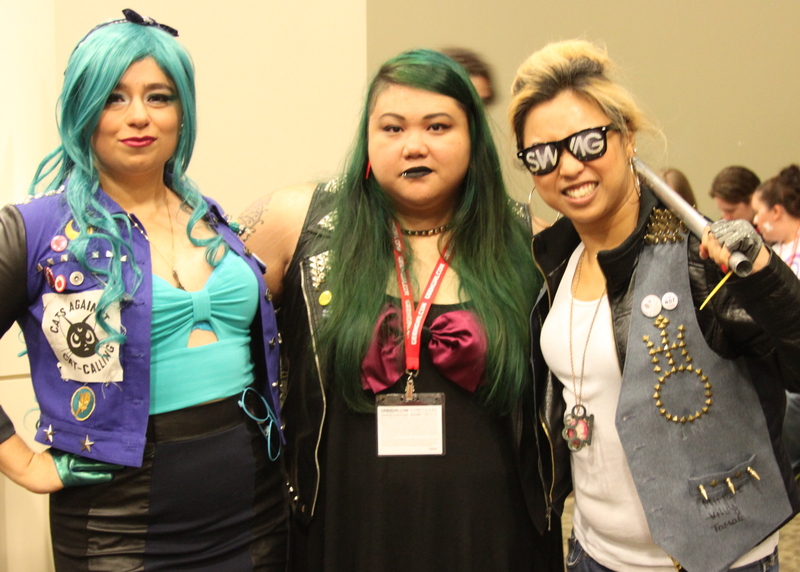 GeekGirlCon ‘14 was spectacular! This was my fourth year attending GeekGirlCon. 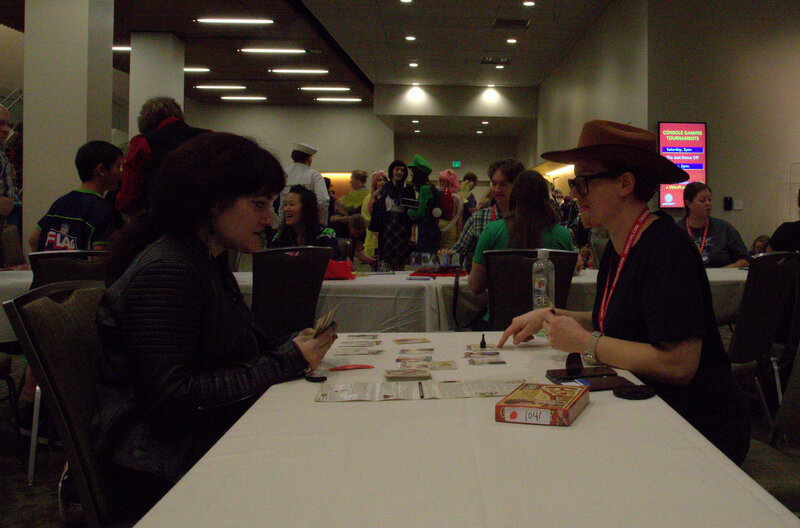 I was a volunteer at the first convention, a special agent (one of our volunteers who works the entire weekend) at the second convention, and have been on staff for the third and fourth conventions. 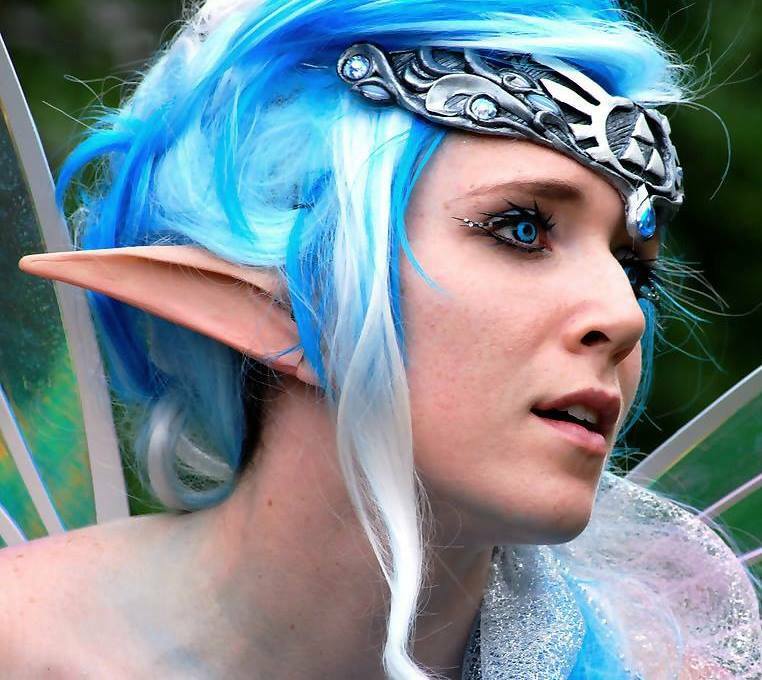 I go through GeekGirlCon with an eye to the inner workings. Talk about tough decisions! The costume contest on Saturday evening at GeekGirlCon ’14 created plenty of Oohs and Aahs, as well as close calls about whose cosplay would be deemed the best. The nearly-impossible task not only fell into the hands of pre-selected judges, but also each audience member, as many winners were decided based upon applause. GeekGirlCon staffers rocking the punk Sailor Moon look. It’s been an amazing day here at GeekGirlCon ‘14! I had so much fun playing “spot the cosplay,” especially with the sheer number of character remixes and cross-plays gracing our convention floor. A special shout-out goes to the Welcome to Night Vale fan who floated their Glow Cloud around all day long, and the baby dancing Groot everyone was buzzing about. 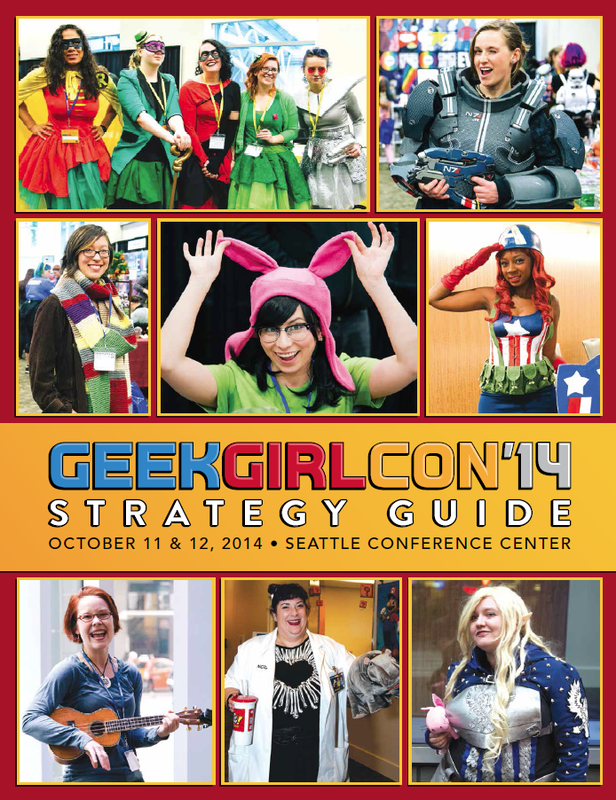 GeekgirlCon ‘14 opens its doors at 9:00 a.m. on Saturday, October 11 and we have so much for you! This is our fourth fantastic year bringing together all those who celebrate the contributions of women and girls in all aspects of geekdom and nerdery. This year, our programming continues to represent our mission to bring a diverse lineup of panels, workshops, and featured contributors. Be sure to check your strategy guide in your swag bag and get the guidebook app to plan out which panels you plan to attend, and which ones you need a time-turner to get to. We’ve been blogging about some of the programming you can see this weekend. Visit the GeekGirlCon ‘14 page to see a round-up! Follow our Twitter, our blog, the #GGC14 hashtag this weekend to hear about all the stuff going on! Most of all, to those are attending, have fun! For those who can’t be there, we hope you can engage with us in the online content.